Pour the stock into a 2-quart saucepan and keep it hot over low heat. Heat the olive oil in a large pot (dutch oven) medium heat. Stir in the onion and cook, stirring occasionally, until softened, about 4 minutes. Stir in the leek and the white parts of the scallions and cook, stirring, until the onion is golden, about 6 minutes. Adjust the heat under the pan as the onion browns so that it cooks slowly with gentle bubbling. Add the mushrooms along with salt and pepper for seasonings, add herbs, lemon zest and juice of half a lemon. Let sauté for about 7 mins. Stir in the rice and continue stirring until the grains are coated with oil and toasted (the edges will become translucent), 1 to 2 minute. Toasting your rice is very important so don’t skip out on this step! Pour in the wine and let it boil, stirring the rice, until evaporated. Season the rice lightly with salt and ladle enough of the hot stock into the pan to barely cover the rice. Bring to a boil, lower the heat so the stock is at a lively simmer. Cook, stirring constantly, until all the stock has been absorbed and you can see the bottom of the pan when you stir. Continue cooking, pouring in the remaining hot stock in small batches–each addition should be just enough to completely moisten the rice–and cook until each batch of stock has been absorbed. Stir constantly until the rice mixture is creamy but al dente. This will take anywhere from 15-30 minutes from the time the wine was added. Make sure to taste the rice during the process to test for doneness. 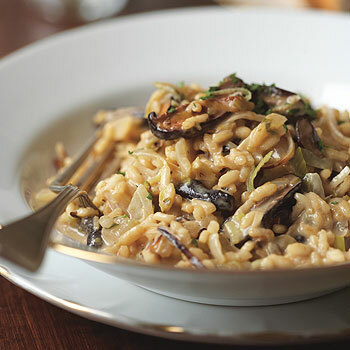 When in doubt, undercook–risotto continues to cook, even after it is removed from the heat. Towards end of cooking process, taste for additional seasons of salt and lemon juice. I like everything lemony so I add the rest of the lemon juice. Remove the pan from the heat; stir in the butter and green parts of the scallion until the butter is completely melted. Stir in half the grated cheese. Taste the risotto and add salt, if necessary, and pepper. Top with freshly grated cheese. 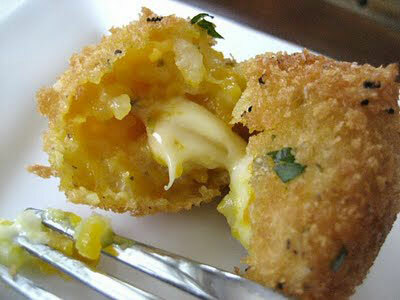 When making my risotto balls, I prefer to just do a coating of panko as opposed to batter… give it a whirl. You would love panko!! and it is an excellent idea.